You may have already heard of nanotechnology and what these can do to help us in the future. 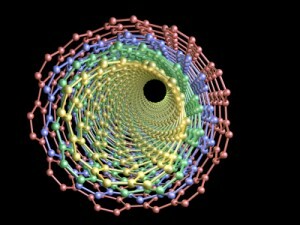 One of the products of nanotechnology is the product known as coiled carbon nanotubes. While the name may sound rather complex, what these tiny springlike objects can do is actually pretty simple yet rather valuable and innovative. Coiled carbon nanotubes are actually minute carbon nanotubes that are shaped like tiny springs. These are so tiny that each one of these coiled little tubes are actually a thousand times tinier than one human hair. Coiled carbon nanotubes are now produced in sheets with the help of a hydro-carbon catalyst mixture. One of the problems researchers were faced in the past with these nanotubes was how to produce them in such a huge number without going above a certain budget. With this new method, they can now produce these sheets of coiled nanotubes, and this production method can now be used at industrial levels with a little adjusting and scaling. This can then be used for a lot of applications that people thought were impossible in the past due to the expensive method of producing in them. Now that the dilemma of being able to facilitate the production of these coiled carbon nanotubes at a very reasonable cost has been solved by a team of researchers at Clemson University, the next step is now to find ways to put these minute springs to good use. One of the most notable uses that researchers find can best suit these coiled nanotubes is that of a cushioning agent. The first viable idea for the use of this product is as a cushioning device for gadgets that are rather sensitive to shock impacts and for items that will do well with impact protection. These sheets made with coiled carbon nanotubes seem to be ideal for use as protective coats for such items that suffer damage with the slightest impact, like mobile phones and other similar gadgets. This was tested with the use of a sheet of coiled carbon nanotubes and the dropping of a stainless steel ball on it. The dropping of this ball on this sheet showed that the nanotubes cushioned the impact and in fact, these coiled nanotubes were even able to recover from such an impact, making them ideal for use as cushioning agents that can protect items from damage when dropped. This idea was also tested on straight carbon nanotubes to see if the coiling of these coiled carbon nanotubes had anything to do with the superior damage protection it provided these items. It was seen that after dropping the same stainless steel ball on a sheet that was made of straight carbon nanotubes, the nanotubes did not recover from the impact unlike the coiled ones. It is therefore prudent to conclude that the coiling of these nanotubes does play a huge role in the cushioning effect needed for protecting objects with. The use of these coiled carbon nanotubes can now be further explored. In fact, talk of using these miniscule shock absorbers in such items like shoe soles, bumpers, and even body armors have already been going on since this discovery. This entry was posted on April 19, 2010, 3:07 am and is filed under nanotubes. You can follow any responses to this entry through RSS 2.0. You can leave a response, or trackback from your own site.